Drawing on the results of this consultation the Carriageworks Action Group is due to agree a final Community Vision at its meeting on 15 December. 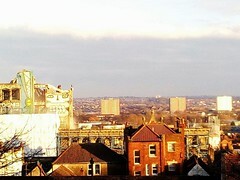 In the spring, Bristol City Council will prepare a ‘development brief’ for the site, drawing on the Community Vision. Later in 2012 the development brief will be used to invite interest from a wide range of developers so that we can select the one that will best respond to the Vision. Please be aware that any redevelopment of the site is likely to take some years. The site is currently owned by Comer Homes. They have applied for planning permission to build 183 flats on the site together with shops and parking. If their application is successful they could progress with the development. We hope that they would then work with the community and help deliver our Vision. I would hope there would be an open tender process inviting submissions from developers who will honour the vision. I worry about ‘shops and flats’ as proposed above, as inevitably this will mean mostly residential and nothing for the community. Keep fighting for it Carriageworks Action Group, I’d hate to see the opportunity to restore this historic building and do something positive for Stokes Croft squandered by the lack of vision of the current developer.